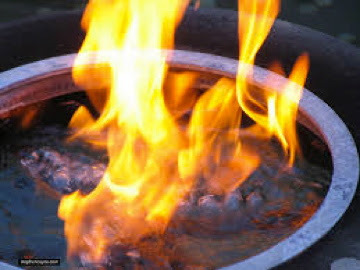 “I have come to set the earth on fire, and how I wish it were already blazing! It's time to look at the Scriptures for this weekend, the Twentieth Sunday in Ordinary Time. In the first reading we find the prophet Jeremiah sinking in the depths of a muddy cistern: his punishment for having faithfully and effectively preached the message God entrusted to him. In similar manner, Jesus speaks in Luke's Gospel of how his word will bring division everywhere, down to the members of individual households and families. Preacher and people alike will find these heavy texts to work with and absorb in the dog days of August! Some respite comes in the second reading from the Letter to the Hebrews encouraging us to let go those burdens that weigh us down in running the race that lies before us. It invites us to consider how Jesus carried the burden of our sins, enduring the Cross - something not yet asked of any of us. These Scriptures are probably not among those most familiar to us and so they deserve a reading and a pondering ahead of time. Be prepared to hear the Word proclaimed and to be nourished by it.